When many people begin to experience symptoms of incontinence they also begin to gradually withdraw from many activities that they previously did or enjoyed. Because of the stigma of suffering from incontinence many people feel isolated and alone in dealing with it. They fear having an embarrassing incident in public so they limit their contact with the outside world. Feelings of isolation can quickly turn to depression. However, when people who experiencing incontinence find that there is a wide variety of products that help them manage it they often feel relief and joy that they can return to their normal lives. Incontinence pads can provide the necessary level of protection that any incontinence sufferer needs. Unlike 'period pads', pads designed specifically for incontinence contain super absorbent polymers and absorb and hold urine much better than a period only pad like Kotex, Always or Stayfree. It can be difficult to find the information that you need about managing incontinence due to the stigma that is attached to it. Many people are hesitant about talking about it. However, because of the new availability of many online sites that offer incontinence pads users can shop from the privacy and ease of their own home or office. The standard size pad-These pads usually come in a couple of different sizes and are packed so they can be carried around. Many people with incontinence use these as spare pads for when they are out of the home. Stick on pads-These highly absorbent pads can be fastened onto normal or incontinence underwear. Keep in mind that they are only designed for short term protection. Disposable shaped pads-This type of pad can be used by both males and females. This pad has been widened at the front and back. Best of all it can be bought with different absorption levels. This means that the person with incontinence can use a mini pad for mild incontinence all the way up to a maxi pad to help manage heavier incontinence symptoms. 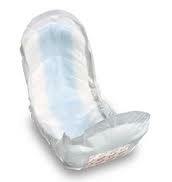 Disposable dry form shaped pads-These types of pads are best for individuals who have moderate to heavy incontinence. They are designed to be super-absorbent. Many people like using them because they offer a wider shaped backing that can deal with bowel incontinence and the protective leg barriers that will protect against leakage by repelling fluids. Male guard pads-These specially designed pads help male patients by providing the highest level of protection possible. In addition, they can be worn under normal clothing making them highly discreet. Disposable total protection pad-These pads work for both sexes in cases of very severe incontinence. They are offer high levels of protection for individuals who are bed ridden, or physically handicapped in some way. They also come with water proof leg cuffs and an adjustable waist. Poise was the first pad designed specifically for incontinence. Originally in 1992, there were two absorbencies. Now there are more than 26 different sizes, styles and absorbencies. Plus there are many different brands to choose from today. With all that comes confusion. Its best to try a sample or two before you buy so that you don't make the costly mistake of buying a whole bag or cases that you can't return.